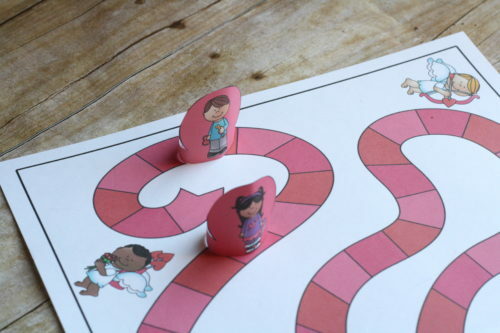 This fun Valentines Day addition game is the perfect addition to a Valentines Day math activity! Practice sums of 5-10 with this lovely game! We’ve been picking our cards for a V-Day party and I’m really excited that there is a good selection of cards without candy! The boys picked out cats, unicorns, and army men. And they are super excited about all 3! So I think we have successfully avoided candy cards and they are still really happy. Great news, right? All this week Cassie from 3Dinosaurs.com and I are doing Valentines Day printables! 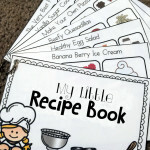 Lots of printables, all pink, red, and hearty. (Yes, that was a pun, I can’t help myself). Please sign up for the newsletter if you’d like to receive an e-mail at the end of the week with links to ALL of it. 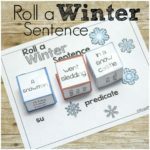 And then I can send you an e-mail every week with tons of great links to other themed printables! The game is relatively easy to set up. Simply cut off the edge of one of the pieces of the game board (it prints onto two pages) and tape the two sides together. They overlap slightly to make it easier. Make sure to print the cards double sided! Cut out the game pieces and tape the long ends together so they will stand up. 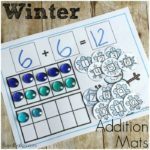 Cut out the addition cards. It’s hard to see in the picture, but there are three different colors for the cards. You’ll need to separate them out. Each person spins the spinner at the beginning of their turn and moves that number of spaces. You’ll draw a card the same color as the space you land on. As you collect cards, you try to work out some equations. 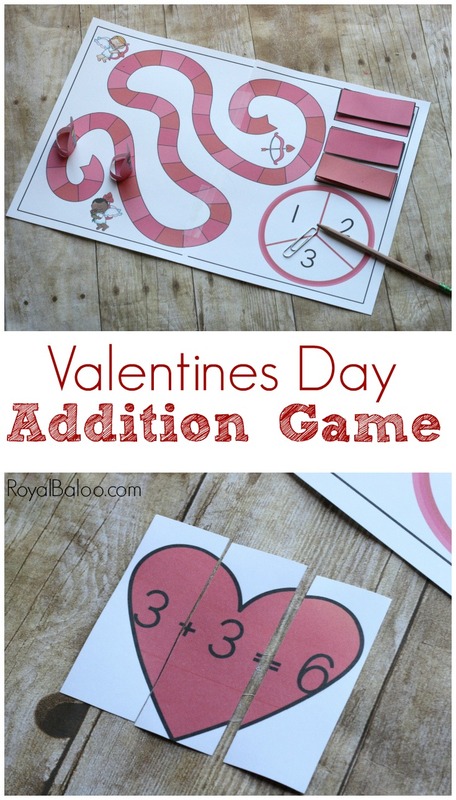 You’ll need one card from each color group to make a complete equation (and to make the heart! ).